Client is currently using WooCommerce and Subscriptions. The products are variable subscriptions. 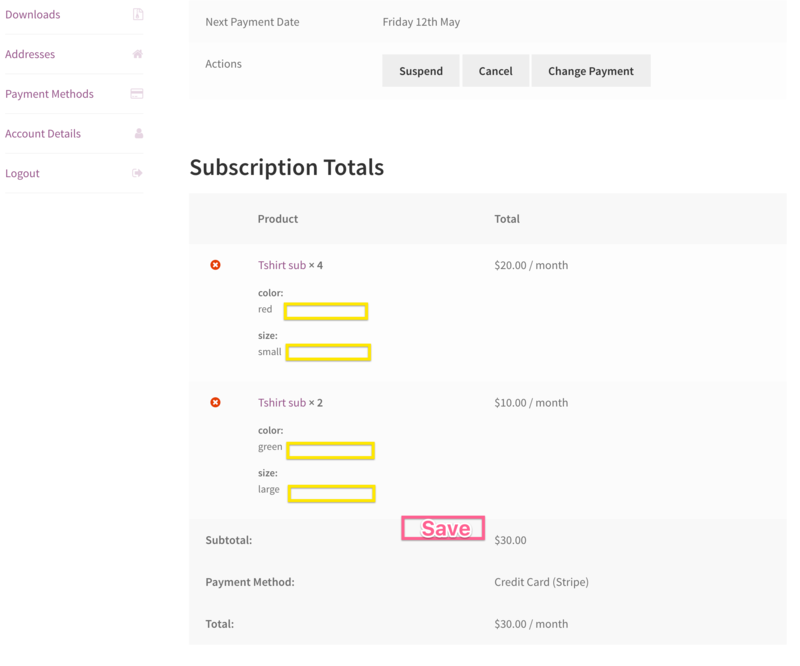 Switching is allowed, but client does not like that customers are sent through the checkout page when they switch between variations as prices tend to be the same. Client would like customers to be able to update their variations from within the My Account section. In most cases the switching on the site would not result in a change in the cost of the subscription so there is no need for the customers to go through the checkout process. Client would like to run a promotion where when someone orders the "Free Trial Product" (a sample of the products the company produces) they will automatically be subscribed to the existing subscription product, or a duplicate of it, for the following month. on the View Subscription screen under My Account each variable subscription line item would have two drop downs for size and colour (yellow box). A button to confirm variation changes would be below all the line items (purple box). Clicking on the button would update the line item to the new variation selected. Functionality would take into account stock levels, and wouldn't offer a variation that doesn't have enough stock. if more than one item was ordered, they wouldn't be able to change only some of them. It's possible, but would need to know client wants this.